Luis Suarez has started his summer by insisting he wants a transfer out of Liverpool. It certainly seems that whenever he goes away on international duty with Uruguay something controversial occurs. This time he’s decided to put himself in the shopping window. This past week he has released several statements showing his interest in moving out of Liverpool. He has continued to insist that the move is not for playing reasons, money reasons, or a desire to play Champions League football. Instead he says that he wants to get out of England and away from the British media. Luis Suarez says that the tabloids have hounded him in England and that he is tired of the attention. While this is almost certainly true considering the number of times he’s been in the papers, it is a poor reason to want out of Liverpool Football Club. I find it intriguing that he has started up on this while he is away from the club on international duty and that he didn’t have more to say around the time of his most recent incident. He has repeatedly put himself under scrutiny for his actions and it’s no wonder that the media gets on him. 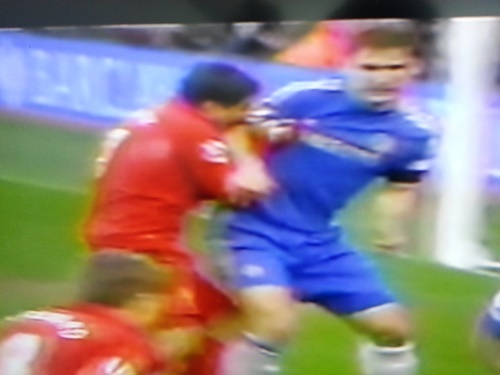 After all, Suarez did bite Branislav Ivanovic. He has also been involved in numerous handball incidents including one against Oldham in the FA Cup Fourth Round match. Early in the season he refused to shake Patrice Evra’s hand during their match with Manchester United. This came after his eight match ban for racially abusing Evra. Through all of this Liverpool Football Club has stood by Suarez and defended him, even when he was involved in the indefensible. Many pundits have even said that the handling of the Suarez/Evra incident led to the firing of Kenny Dalglish. In his time at Liverpool he has been suspended for 18 matches, yet has never been sent off or given a yellow card. Instead of saying thanks to the club Suarez has continued to put himself in the headlines and continued to involve himself in questionable acts time and time again. There is no doubt that he is an excellent, world class football player. One of the best in the EPL and in the world, but until he is able to reign in his attitude and avoid these controversies he will not be the complete player he should be. He is still relatively young and has time to transform his image, but this most recent turn of events does not help him at all. Liverpool have said they have no plans to sell him, but would be discuss any offer over £50M ($76M). If he does leave Liverpool the most likely destination would be Real Madrid who may be parting ways with Higuain and could use a replacement like Luis Suarez. If Suarez does engineer his transfer out of Anfield it will be to the detriment of more than just Liverpool. The EPL will miss such an exciting player in the league, despite his penchant for controversy. He does bring a quality of play to the league that is entertaining to watch for soccer fans around the world. I find it hard to believe that leaving England is going to be the answer for him. The only way to get the media off his back is going to be by changing his actions. Unless he is able to stop with the scandals there will always be this attention on him. I’m sure a change to Spain will relieve some of the pressure on him for the diving and some of the other cultural issues, but biting a player is not going to be tolerated no matter which country you go to.